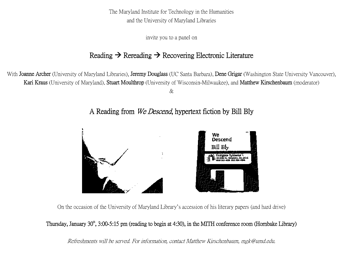 Over three days, We Descend will be worked over at a small Symposium at the Maryland Institute for Technology in the Humanities, starting with a panel Thursday, 30 Jan 2014 with a panel, “Reading —> Rereading —> Recovering Electronic Literature”, 3 pm in the MITH conference room, Hornbake Library. Right after that, BBly will do a reading that includes Writings from both Vol 1 & Vol 2 of We Descend, commencing at 4:30 pm, “On the occasion of the University of Maryland Library’s accession of his literary papers (and hard drive)“. On Friday, 31 Jan 2014, Dene Grigar and Stuart Moulthrop will conduct a “traversal” of WDvol1 in its original instantiation in Storyspace v1 on an ancient Macintosh, for their NEH Pathfinders project. Other early hypertexts sujected to this process have been Moulthrop’s own Victory Garden, John McDaid’s Uncle Buddy’s Phantom Funhouse, Judy Malloy’s Uncle Roger, and Shelley Jackson’s Patchwork Girl. Then on Saturday, 01 Feb 2014, BBly will be interrogated for a couple hours to ascertain whether he is truly qualified to act as the Curator of the Archives Pertaining to Egderus Scriptor.